Fitbit Force or Lifetrak Zone which one to buy? 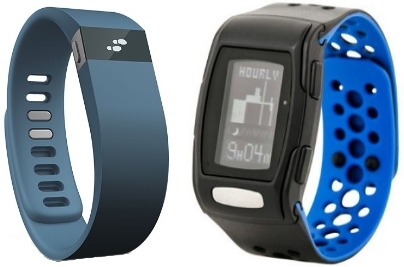 How do the Fitbit Force and the Lifetrak Zone C410 compare? The Fitbit Force and the Lifetrak C410 both demonstrate how the science that has gone into creating wellness tracker bands has resulted in the most impressive health-monitor-on-a-wrist products that have ever been seen in the market. But which among the two is the superior wellness tracker band? To answer that question, there’s a need to understand that the philosophy behind wellness tracker bands is that they provide information about their wearers’ health and activities in the hope of driving these individuals to make changes in their lifestyles that will lead to their improved overall health. Therefore, the more superior wellness tracker band is the one that has features that are better able to provide users with information about their health and activities, which in turn, should drive them to lead healthier lifestyles. The Fitbit Force prides itself with its pioneering incorporation of an altimeter, which can track how many flights of stairs a user has climbed throughout each day. The technology is groundbreaking in that other fitness trackers have only been able to consider distance travelled in tracking how many steps their wearers have taken, which is, in turn, used to compute for how many calories users have burned. Furthermore, the Fitbit Force also considers “active minutes” — defined as periods of intense physical activity, such as jogging and playing tennis — in its computation of calories that a user has burned. Thus, through the incorporation of an altimeter and by considering a person’s “active minutes”, the Fitbit Force can boast to have added two features that more realistically compute for the number of calories a user has burned. 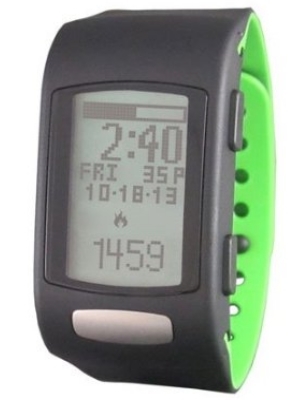 On the other hand, while the Lifetrak Zone C410 features don’t include an altimeter, it can pride itself with being the first fitness tracker that uses a calorie algorithm that can dynamically consider a user’s running, jogging or walking motions to adjust its computation of the number of steps a user has taken — a Lifetrak patented system. More importantly, though, its other patented feature, the S-Pulse, can take ECG-accurate measurements of a user’s heart rate, information that is then used to compute for the number of calories a user has burned each day. Therefore, while the Fitbit Force features an altimeter and considers “active minutes”, the C410 trumps those two features with its impressively accurate heart rate measurements, a better basis for computing caloric burning. One seeming advantage of the Fitbit Force over the Lifetrak C410 is that the latest Fitbit release can be used to track what a user takes in by providing an impressive database of various types of food and drinks through which a user can record caloric intake. However, the problem with this feature of the Fitbit Force is that while its listing of processed and purchased meals is very extensive, it becomes hopelessly tedious to input every ingredient of each home-prepared meal a user takes in, making it next-to-impossible to have an accurate and complete summary of a user’s caloric intake. The Fitbit Force can monitor how long a user sleeps and also what fraction of that sleeping time can be considered restless sleep based on the user’s movements while sleeping. 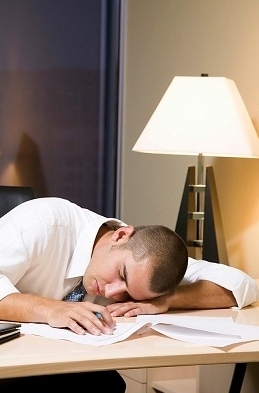 The feature can be activated by a user just before sleep, and if ever a user forgets to activate the feature, the sleeping period can be inputted into the system, and the app can then go back and lay in the data it recorded of the user tossing and turning in sleep to determine the quality of sleep during that period. 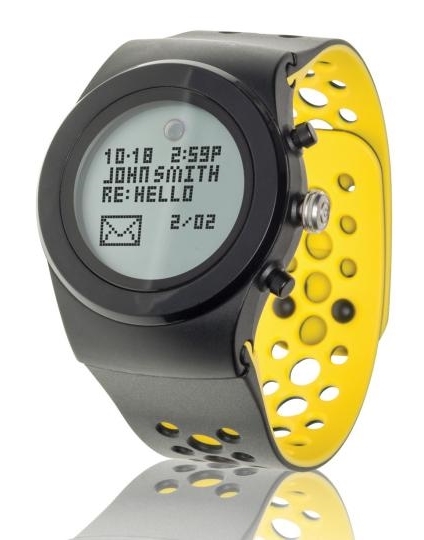 Furthermore, it features a vibrating alarm that wakes a user up at a user’s set time. The Lifetrak C410 features don’t include an alarm, but the C410 definitely makes use of more advanced sleep quality tracking technology. Like the Fitbit Force, the C410 takes into consideration its wearer’s movements while sleeping in addition to sleep duration to determine the quality of sleep a user gets each night. However, where the C410 beats out the Fitbit Force is its ability to automatically detect when a user falls asleep and wakes up, making it unnecessary for a user to press a button to activate the sleep-monitoring feature. 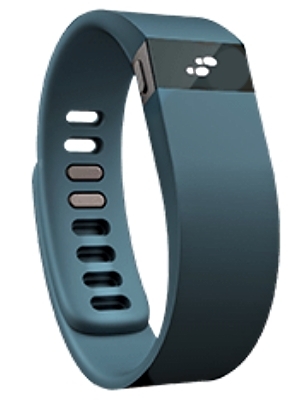 Connectivity with other devices is an area that the Fitbit Force can claim to dominate over the Lifetrak Zone C410. With Bluetooth technology, the Fitbit Force can sync automatically with a user’s computer and iPhone models 4s and above, plus more recently released Android devices. 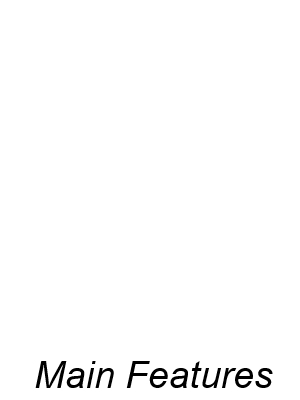 Furthermore, if a user has an iOS7 device, the Zone can receive incoming call notifications showing the caller’s name or number; however, this feature has yet to be rolled out awaiting an update from Fitbit. Moreover, with the Fitbit Force, users, through both newer iOS and Android devices, can compare readings and send messages or smack talk with authorized friends who also have the same device. 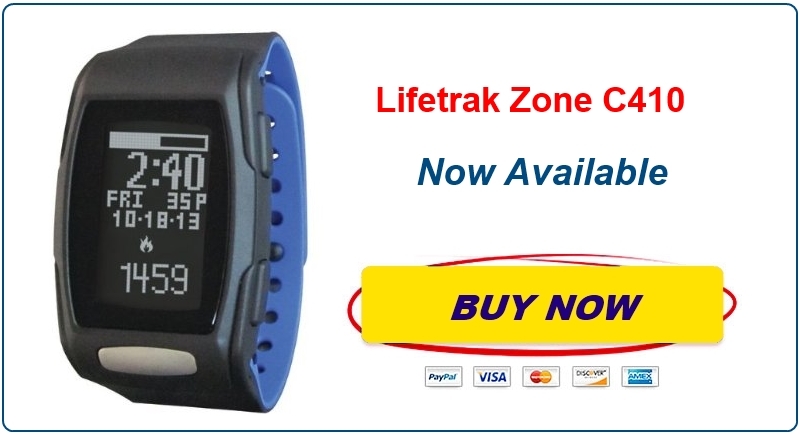 The Lifetrak Zone C410, however, isn’t that far behind as it also uses Bluetooth technology to enable users to transfer data captured by the Zone to their smartphones. In turn, this allows users to view their results from the most previous 7 days. When it comes to judging these two wellness trackers’ looks, it’s a matter of taste, really. 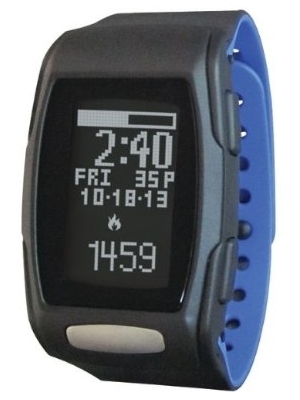 The Fitbit Force, with its OLED display, looks like a sleek rubber bracelet that comes in two colors (black and blue) and two sizes (small and large). Its clasp design, which secures the device to the user’s wrist, was built to make the Force as flat as possible. However, a criticism of the Force is that it’s chunkier than the Fitbit Flex, an older model of the device. 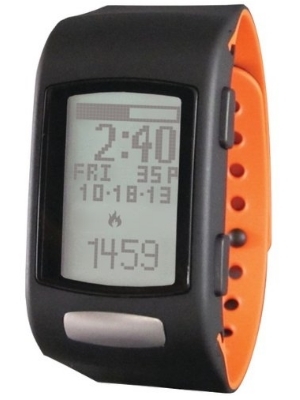 The Lifetrak C410, with its bigger display screen, on the other hand, looks more like a sporty wristwatch. 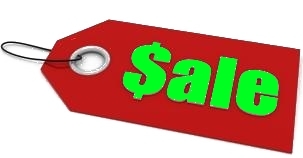 But unlike the Fitbit Force, its bands are reversible and interchangeable, a total of 8 different-colored wristbands being available to more fashion-conscious users. The Fitbit Zone features a battery that can last for 7 to 10 days before it needs to be charged with a USB cable, and Fitbit can send a user an email notification when it’s time to charge the battery. With the Lifetrak Zone C410, charging isn’t a concern since its battery lasts for over a year, thus encouraging continuous use. The Fitbit Zone is listed as being water-resistant, quite unimpressive when compared with the waterproof Lifetrak C410 that can safely be submersed in up to 90 feet of water, allowing the device to be used even when swimming. 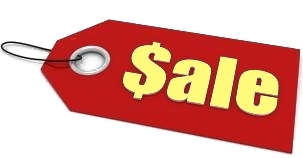 Buying the $130 Fitbit Force will set a user back $30 more than purchasing the $100 Lifetrak, a significant price difference. Overall, because the Lifetrak Zone C410 does a better job at tracking its users’ activity and sleep behavior — not to mention costs less, doesn’t need charging, is waterproof and is $30 less expensive – it seems to be the better buy. 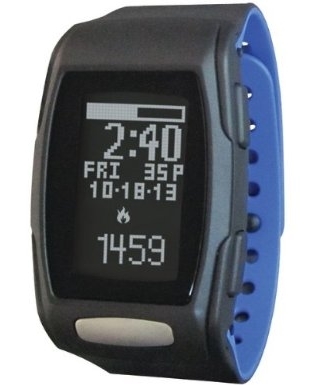 Yes, the Fitibit Force claims to be able to record a user’s caloric intake and to have better app connectivity, but considering that a superior wellness tracker band should provide its user with higher quality information with the user exerting the least amount of effort, it seems that Lifetrak C410 is the product that can help users more in leading healthier lifestyles.